For much of its history, Hamilton has found inspiration in the skies and has a long list of aviation timepieces in its product logbook. Propelling its pioneering aviation spirit to new heights in the year of the brand’s 120th anniversary is the dynamic Hamilton Khaki X-Patrol. This highly sophisticated chronograph integrates the new H21 caliber with its excellent accuracy and extended power reserve. Equipping the wearer for today’s globally minded environment is a unique mechanical conversion facility to give accurate equivalents of a selection of units in either metric or imperial systems. In terms of styling and craftsmanship, this intricate timepiece visibly goes the extra mile with highly resistant modern materials and a keen eye for design detail. Black or silver dials, with contrasting reflectors, are perfectly complemented by a black leather strap with fine white stitching, a sporty black rubber attachment, or a metal bracelet. 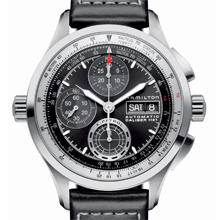 Its aviation theme is omnipresent, even on the back of the watch, which integrates a propeller-inspired design, offering regular glimpses of the automatic chronograph movement in action. A ridged effect on the side of the bezel also reminds of precision engineering. 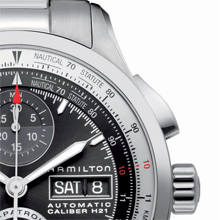 Aviation is about accuracy and the Hamilton Khaki  X-Patrol reflects this inside and out. Details such as the fine markings, screws visible on the case back and practical antireflective coating on the sapphire crystal underline the commitment to quality and durability. 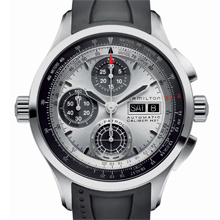 Water resistance to a pressure of 10 bar ensures that this watch is at home in all environments, airborne or otherwise.